We have been talking about Megalo for some time, I remember the discussions we had on the site a few weeks ago. The released preview rose up a lot of questions. 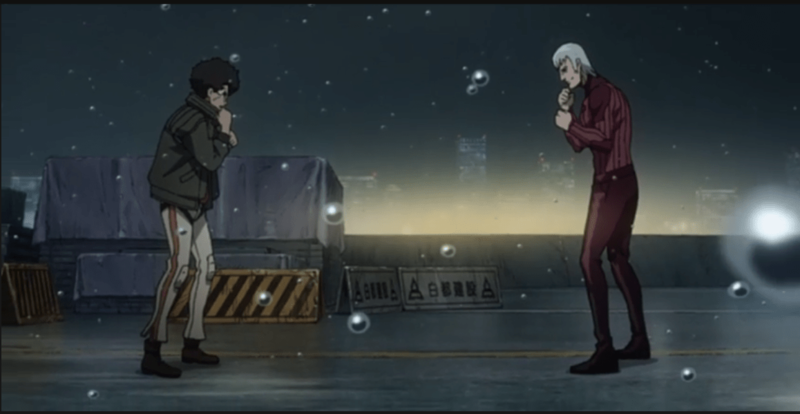 If you did not hear about it, the studio behind Megalo Box released a short preview of 1:50 minutes footage from episode 1. The preview left us a bit in the dark but also excited to see how it will go. 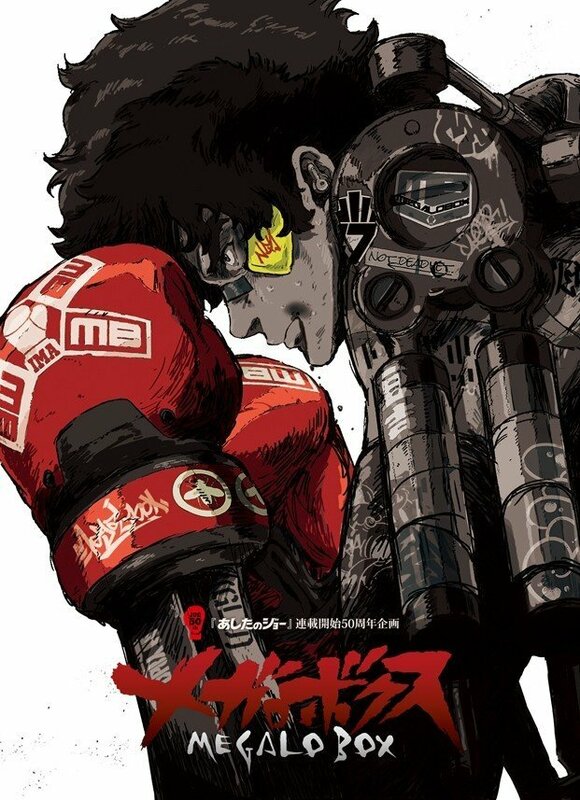 And yesterday Megalo Box episode 1 has finally aired. I did not get to watch it yesterday as I was a bit busy. But I have decided to watch it today, and hence make a review on it. If this goes well, I might make an episodic series of reviews based on this anime. The concept of the anime is really interesting, as it seems that the anime is in a futuristic setting. Gear is put on fighters which they then use for fighting. From what I understood in the first episode the main character is one of the few people left who actually has good boxing skill. And most other just use gear to enhance their ability and “brawl”. Megalonia as a tournament disappoints Junk Dog, as he said we can clearly see that there is more brawling than real boxing. Before I go further down on this review I gotta warn you that it will contain some spoilers so it might be better to watch the episode first and then give me your opinion. The first boxing scene was Junk Dog versus Ghetto Hachiya. Before the fight, we see Junk Dog talking to his manager. His manager is a dirty guy that likes betting and earning money, he makes him give up the match on purpose because of money. Of course, our main character did not really like it and hence had some retaliation. But that did not stop him from forfeiting the match. In the first match, we could obviously see that Junk Dog had the upper hand and could KO poor Hachiya when he felt like it. However, he had a lack of money and hence needed to lose. Another interesting thing that we learn in episode 1 is the difference between society. It is obviously set straight that there are two different class of people living in that city. Although, we still do not know the details behind it. Towards the end of the episode, Junk Dog runs into Yuri and his Owner, I forgot the woman’s name. But I know that she was the president of some big company that is developing this gear. And she is also the one responsible for organizing Megalonia. Megalonia is a world boxing tournament using gear that determines the strongest fighters. This setting kind of reminds me of Tekken a bit. 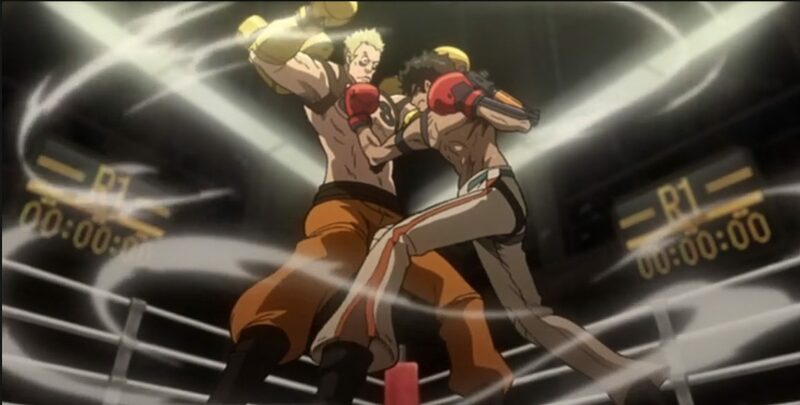 The main character and Yuri who is said to be the world champion in Megalo Boxing clash towards the end of the episode. However, we were not able to see their fight. Honestly, I expect Junk Dog to stand up to him but in the end, lose. If he beat him up now it would be too easy. And there would be no room for improvement and character development for Junk Dog. Megalo Box episode 1 has revealed to us that the anime itself truly has potential. And, I am happy to see that it is not like Hajime no Ippo. Even though the movement and boxing looked similar, it was not the same feeling. However, there is one thing that is bothering me and that is the usage of this gear. I have said this from the beginning, and before we have even seen Megalo Box episode 1 I have been skeptic about it. Yes, it truly brings in a new concept to the anime, but how will it end up. There are two possibilities, first one is that it will end up being completely useless and that the boxing part will look the same as normal boxing just with metal arms. Although, there is also the possibility that they might take a wrong turn in it and make the gear evolve into super Saiyan mode and what not. Also when talking about new anime you might want to know about Goblin Slayer and Vinland Saga which I’m pretty excited about.